Snow's on Carson Peak -- and in a lot of other places, too. 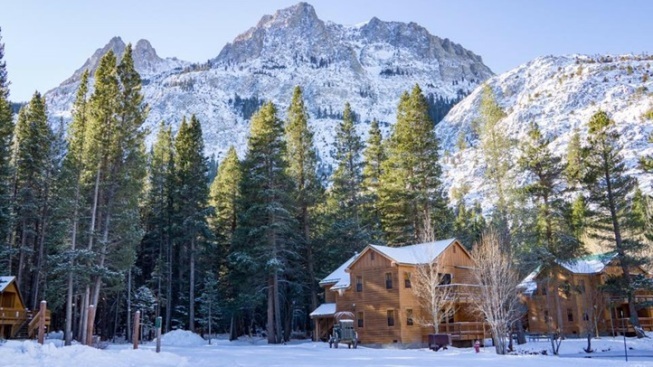 Cozy cabins and Carson Peak make a charming combination in the wintertime (and all the time). MOUNTAINS, CABINS, POND, SKY: The peak-lined valleys and mountain-pretty dells of the Sierra are numerous and as individual in their distinctive beauty as people are. Simply put, it's hard to lump a bunch of massive peaks into one grouping, a grouping that contains the header "Really Tall Pointy Earth Features." Each is a poem, to get gooey, and Sierra regulars have their favorites. For many travelers Carson Peak is at the top of that hallowed heap, and it is not hard to see why: Not only is it extravagantly tall and craggy and full of rocky features, but it just seems so near and sheer, giving it all the more presence. HELLO, JUNE LAKE: It is quite near, at least as massive peaks go, lovely June Lake, and specifically Double Eagle Resort and Spa, a cabin-filled property that's become something of a Sierra staple. Thank the many choices for bedding down -- you can pick a loggy-style, oh-so-woodsy building that contains four rooms, or a set-alone cabin -- and thank that pretty pond that's a central feature. The resort'll celebrate its two-decade anniversary in just a couple of years, a good amount of time for a hotel but a little less time than Carson Peak, the 11,000-foot mountain that watches over the picturesque spread, has been around. SPA TO SUPPER: Going the cabin route so often means either keeping close to your room or heading to the outdoors for some nature-based play, with fewer ways to pass the time beyond those two things. Double Eagle offers both the woods-close, cabin-y experience, but with a few mix-it-up options, like the on-site spa (look for the rustic Old West-style theming in the locker rooms and next to the hot tub) and Eagle's Landing Restaurant, which boasts not one but two windows that frame Carson's Peak. Is it distracting to look up a rocky feature that lends June Lake its nickname, "The Switzerland of California," while you dine? Au contraire: You feel away as away can possibly get from whatever bustling environment you left behind for the weekend.